Torry is one of the oldest parts of Aberdeen. Records show a community existing as far back as 900 years. It was once a Royal Burgh in its own right but was incorporated into Aberdeen in 1891 after the construction of the Victoria Bridge. 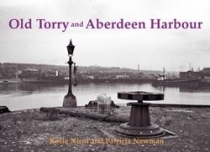 The channeling of the River Dee in 1871 resulted in the loss of many of the old fishermens' cottages in Torry and much more has also been lost to restructuring to accommodate North Sea Oil activity since the 1970s. These photographs help to preserve the memory of the region as time and industry march onward.